The Hayward Perflex D.E. Pool Filter operates in a different way then most D.E. pool filters. This type of filter cannot only be back washed but the filter also has an option called “regeneration” which allows you to get the most from your D.E. powder. The Perflex filter also has something called a “bump handle” that most D.E. pool filters do not have. This bump handle allows you to shake the D.E. from the pool filter fingers that are inside of the tank. 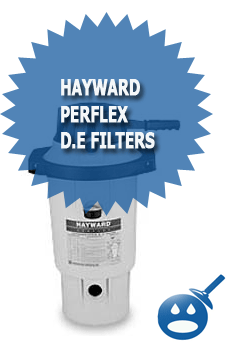 The Hayward Perflex filter has man options that may seem confusing at first, but once you read and learn how to use this type of pool filter you will have no problem keeping your swimming pool clear and blue. You will need a bag of D.E. powder before you can operate this type of pool filter, So if this is your first time working with this type of swimming pool filter, then the first thing you are going to need is a bag of D.E. powder that can be bought online or locally at any pool supply store. What Does Bumping The Handle Do? Bumping is when you lift the bump handle on the top of the Perflex filter up and down. When you bump the handle you move the tube sheets inside of the filter up and down which causes the D.E. to loosen up and move around inside of the filter tank. What Is Back Washing The Filter Mean? Back Washing is the process of removing dirt, debris and also D.E. powder from the pool filters tank. This is done using the swimming pool filter systems pump. You first have to bump the handle on top of the filter a few times and then open a valve to back wash the filter. See below for a full lesson on how to properly back wash your Hayward Perflex D.E. Pool Filter. How Does The Hayward Perflex D.E. Pool Filter Work? There are a few main parts that you will always be working with when you operate your Hayward Perflex D.E. swimming pool filter. The main parts are the filter gauge, the bump handle, the back wash valve and you will also need to have a supply of D.E. filter powder. When a filter is brand new or just has been back washed there is no D.E. powder inside of the filter. Inside of the filter is something called “fingers”. These filter fingers are plastic tubes that are covered by mesh that allow the water to flow through them but not the D.E powder. When you add D.E. powder through the skimmers, the D.E. powder travels through the swimming pool plumbing, then enters the filter where the D.E. powder then coats the filter fingers. Once the filter fingers are coated with D.E. powder the pool water flows through the fingers and then the D.E. powder catches all the debris. Once all of the D.E. inside of the filter gets covered with dirt and debris, it will be time to regenerate or back wash the filter. What Is D.E. Filter “Regeneration”? Regeneration is a bit different than actually back washing the pool filter. When you regenerate you are basically “flipping” & “re-using” the existing D.E. inside of the pool filter. When you back wash you are removing the old D.E. powder from the pool filter and then replacing it with new. Regeneration does not require you to replace the D.E. powder because you are just “bumping” it around and its sticking back to the filter fingers inside of the tank. Regenerating your D.E filter will allow you to get a bit more filtering action from the D.E. inside of the filter tank. The first thing you will want to do is shut the filter system down. Once you have shut the filter system down you will want to bump the handle up and about 10 times and then you will want to turn the filter back on again. What the bump does is loosen all of the D.E inside of the filter, turning it over and then once you turn the filter back on the D.E. re sticks to the filter fingers. You will want to regenerate if you see the flow of your filter start to slow down. If you have regenerated your filter but you still have poor flow, then your best bet would be to just back wash the filter which removes all of the D.E. from the filter. How Often Do I Back Wash My Perflex Filter? On the side of your filter you will have something called a pressure gauge. This pressure gauge measure the amount of pressure that is inside of your pool filter tank. When your filter has just been back washed you should take a look at the number on that gauge and see what your “normal operating pressure” is. When the pressure on the gauge raises 5 – 10 LBS above the normal operating pressure the filter will have to be back washed. When the pressure inside of your filter tank rises you will have to back wash the pool filter. To do so, the first step is to shut down the filter system. Once you have shut down the filter system you will want to bump the bump handle up and down slowly at first but in the end you will want to bump that handle 15 or so times. Once you have bumped the handle you will want to open up the valve that is located on the bottom of the filter tank. This is called the back wash valve and when you open it pool water and D.E. will start coming out. Once you have opened the valve you will want to turn the filter system back on for about two minutes to forcefully flush all of the D.E. out of the filter. Now that all of the D.E. powder has been flushed from inside of the filter tank, you are going to need to add more D.E. powder to the filter. You can do so by making sure that the filter system is turned on and running and then you will want to walk over to the pool skimmer and add the required amount of D.E. to the pool filter. You can do so by scooping the D.E. powder into the filter slowly and 1 LB at a time. When & How Do I Add More D.E. Powder? 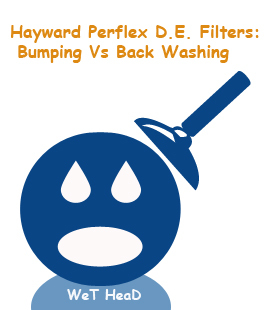 Every time you back wash the Hayward Perflex filter you will need to re-add some D.E. powder to the filter. Once you have finished back washing you will want to turn your filter system back on. Once the filter system is back on you will want to look on the side of the filter tank and see how much D.E. you are supposed to add to the filter. Once you find out how much D.E. you need to add to the filter you will want to walk over to the skimmer and add that amount slowly inside the skimmer until it all has worked its way to the filter. The best way to get the longest life from your pool filter is to properly take care of it. You should take your filter apart at least once in the beginning of the season and once at the end of the pool season. This way you can clean the filter fingers, inspect all of the o-rings, inspect the tube sheets and keep the inside of the filter is perfect shape. If you have any questions, please feel free to ask them below. I just got a new pool. When the guy came to open the pool, he mixed 5 scoops of DE into a bucket, mixed it with water and slowly added it to my skimmer. He told me that if my pressure got too high that I need to turn it off, bump the handle, backwash it and then add more DE. The pressure got too high so I did what he told me. Within a few hours, the pressure got way too high again. When I called the installer he said that I must have not properly washed out the old DE and then added too much back in. He then had me take apart the whole thing and hose it off. Keep in mind, this is all brand new equipment that was only used a week. When we talked to people at another pool place, they agreed and said that there was probably too much DE in there. Then they explained to me that you have to weigh out the DE to put the right amount in the pool. When I read the directions, I realized that I need 6 lbs of DE and when I measured out what the other guy put in, he only put in about 2 lbs worth. question 1) can the pressure be too high when there is not enough DE? question 2) when I put more DE in, won’t the pressure increase? Basically there was not nearly enough DE and the pressure was already too high so adding double or triple the DE would make it worse wouldn’t it? I am having this same problem. Someone please answer. I am having the same issue as above. would love some help on this. i feel if i add to little pressure is too high. add to much pressure SHOULD be too high. This is a very good review guide of maintaining Hayward filter. I have a different problem that is not discussed in your article. I have an inground pool and using the Hayward Perflex D.E. filters. The model is EC-65. When my Hayward filter turns on in the morning, the water returns into the pool is cloudy for a minutes. It appears the DE is coming with it. Then the water will be clear afterward. I am wondering, do I have a leak in the filter that allows DE coming into the pool. Because my pool water is balanced with ph, alkalinity and chloride. I had my water tested many times and added clarifying agents again and again. My pool water is not clear and not able to see the bottom. Do you mind to give me suggestions to figure out the problem of my filter? Thank you. I have a perflex 40 and it seems I have a crack in the water diffuser just behind the check valve. I cannot get it out to replace it. Is it molded into the body of the tank? I have an EC50 per flex filter with the bump handle. The handle will not move. I cannot get it to go up or down. Can you give me some troubleshooting tips? I have ec65a de filter, if a finger inside filter is broken but not tore, will it leak de into pool? I have an EC60 and I disassemble the filter and hose it down. I do this every 2-3 weeks because the pressure gets so high it will not filter. I have done a yearly acid wash at the beginning of the year. I have weighed the powder, so I know I am putting in the proper amount. Sometimes when I backwash it no power comes out. I open up the valve and pump it a bunch of times and very little comes out. I put more DE in and it is so impacted that I need to take it apart again and it is loaded with alge.